We discovered late last night that we were completely out of water. Usually there are two tanks with a flow valve but on this one all the fresh water feeds from the two. With the indicator showing 1/4 full I was concerned the pump was gone; also we just couldn’t believe we’d used 300+ litres in three days. We hoped to fill up on the Itchenor pontoon and as we were getting ready to leave one of the two spaces freed up. After scrounging a short hose from the harbour master and Helen taking aim at the water inlet from 3ft we managed to fill her back up to half and were off. The exit from Itchenor Reach and Chichester Habour was uneventful and peaceful, although it was interesting negotiating around a dozen Solent Sunbeam’s tacking their way upwind. The wind was blowing around 8-10kts and the forecast predicted a westerly 4 or 5. 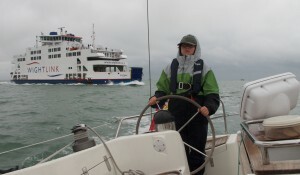 We had the sails up quickly and started on our first tack towards the Solent. It was fairly slow going at first making around 3-4kts with a slight tide working against us. We started on 30 minute shifts on the helm. We had planned to take a route south of Horse Sand Fort but in the end opted for the submarine barrier channel. We set ourselves up so we could harden up or bear away as we approached and several yachts were on their way out which focused the mind. The wind seemed to die down a little after the forts so it became more difficult to sail close to the wind. It did pick up again to around 12kts and as the tide strengthened we were making around 8kts over the ground and about 6.5kts to our waypoint at Prince Consort. 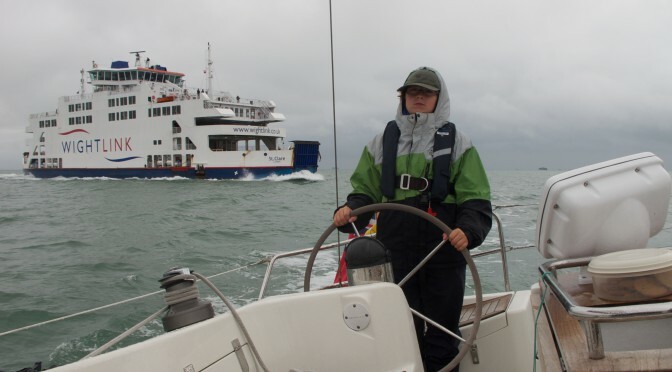 Harry held his nerve after spotting a Portsmouth-Fishborne ferry which we sailed ahead of. We switched the graphic display to apparent wind mode and it told us the angle to apparent (or true) we were sailing at. We managed to hold it fairly easily to 25deg and were now making 8kts towards Lymington due to the strong tide. We listened in to the Coastguard discussion with a yacht under power as they assisted a smaller yacht struggle to make any headway from Gurnard Ledge towards Cowes. The wind as we finished sailing was around 20-22kts but the boat wasn’t in the slightest over powered with all the sails up. I’ve been very impressed how close to the wind she sails – it must have made quite a difference to how long it took us. It wasn’t long before we had the starting platform in sight and on arrival had the sails down in record time. We used our more reliable midships spring to pull up at the fuel pontoon and then carefully backed into our berth, handling the lines to the charter agent.